As I mentioned in an earlier blog post from today, my allergies are really bad today. I just want to sit in a vat of liquid Claritin to try to clear this up. Darn those grasses, trees, flowers in my garden, and whatever else had caused this misery! Thankfully my trusty mail carrier brought me the cure to remedy my allergy-induced grumpiness--my Crater Lake Company order. I opened my box and was cheered to open my box of pink wonder. I love Sharonn's pink tissue paper, crinkle wrap, and CLC's overall sophisticated feminity. I placed just a wee order a couple of weeks ago: three "Sweet Touch" Touch Up glass roll ons in Coconut Bavarois, Creamy Pear Sorbetto, and Pan de Azucar con Leche. I chose the Sweet Almond Oil base, as oil bases not only are more natural, but they work amazingly well in the summer. Your natural body heat brings out the fragrance and when it is hot, I find that an oil base lasts at least 12 hours on me without a touch up. Since my sniffer has barely worked in the past 48 hours, I was afraid I would not be able to give an accurate review of these perfumes. I had my Claritin this morning, sniffed some coffee beans to cleanse my nasal passages (a trick to clearing away scent if you're trying several perfumes so they don't all blend together), and opened up the bottles. The first scent I tried was the Creamy Pear Sorbetto. What a lovely scent. I am on the fence with pear scents in general. Many smell fake, but this is very soft and realistic. You can detect the fresh pear and the gorgeous vanilla with it. It is truly lovely. Next I tried the Pan de Azucar con Leche. At first, I detected a scent very similar to Comptoir Sud Pacifique's Matin Calin. It quickly dries down to a most scrumptious and rich flaky pastry. To me, this is Creme Brulee meets Matin Calin meets a flaky croissant with sweet butter on top. It is very, very nice. I will wear this on an early autumn day. The last scent I tried I am blown away by: Coconut Bavarois. Sharonn's site describes this one as "A crave-inducing sniff that's just out of this world. Our wearable version of this dessert combines the rich notes of whipping cream and whole milk, the creaminess of coconut and the finest vanilla, into a velvety, custard-like sweetness.Perfect worn alone or layered. " Sharonn is usually right on at describing her fragrances so that their true essence is captured. Not this time. Coconut Bavarois is what Sharonn described, HOWEVER, she failed to mention one key thing: this is the best coconut fragrance ever created by anyone at any price range. You literally can detect every single note Sharonn described. I love coconut scents. I like coconut mixed with spice. I like coconut mixed with floral notes. I like coconut straight up. I like coconut and dark chocolate....coconut with citrus....you get the idea. 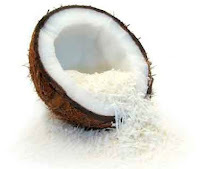 I love coconut in general. Coconut Bavarois is a dessert scent, yes. However, it is taken to a level above your typical "foody" scent. The vanilla isn't a sicky-sweet version. It smells like vanilla absolute to my nose. This is a mature dessert scent. On cold sniff, it smells like a yummy coconut dessert. Once it it is on your skin and dries down, it changes into the most gorgeous scent. I think my husband will love it, too, and he is not into foody scents the way I am. He would be happy if I still were to wear Tommy Girl or Polo Sport Woman everyday like I did back in college when I stopped wearing Peach Hyacinth. This scent is going to result in many compliments from other women as well. I know when I wear this I will not hear, "I love that scent you have on. It smells like a dessert." It will be, "What are you wearing? You smell fantastic. Where did you buy that?" 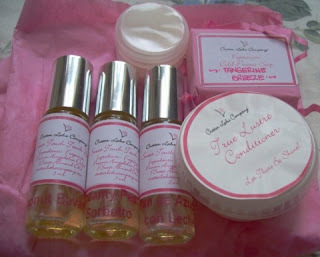 In addition to my wonderful perfumes, Sharonn included a True Lustre Conditioner sample (which she knows I love!) in Pop Star Candy. This is a fun, sweet scent--almost reminds me of the Tootsie Roll Pops with the bluish-purple wrapper that I had as a kid many moons ago. A "Twisted Candy" Aloe Smoothie lotion sample was included, as was a new cold process soap in Tangerine Breeze. If you love COCONUT, what are you waiting for? Stop reading this and click yourself over to CRATER LAKE COMPANY and fill your shopping bag with everything Coconut Bavarois. It is that good. 4:45pm Update: Scent is still going strong. Got compliments (just like I thought) in both the checkout counter at Wegmans and at the hair salon when I took Nick & Ben for their cuts!